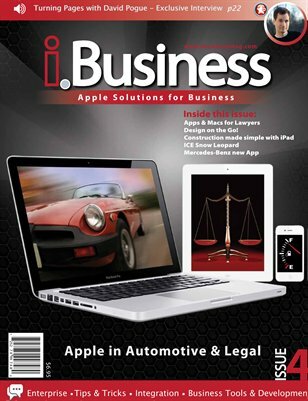 i.Business Magazine Issue #4 Featuring Apple in Automotive and Legal Markets. i.Business, it’s the only Apple-related business magazine in the market. Currently, all Apple-based magazines and publications focus on retail and consumer products; i.Business will be the only magazine in the market that focuses on Apple business & enterprise solutions for the business end users who are using Apple technology, or those looking to switch. David Poguei interview.